GLENDALE, Ariz. (AP) Angels manager Mike Scioscia says the spring training game plan for Shohei Ohtani is still being mapped out. On Tuesday, Scioscia said Ohtani will throw a bullpen session on Thursday and a decision will be made after that on when the multi-talented Japanese pitcher/hitter will make his first appearance in a spring training game. 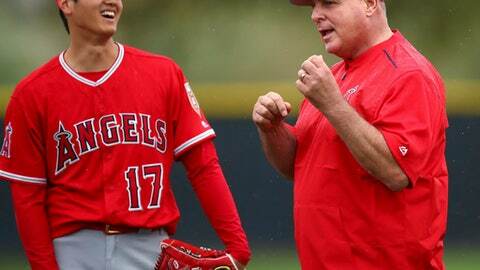 Scioscia wouldn’t rule out a weekend appearance, saying only ”we’ll see,” but said it’s unlikely Ohtani would make any pinch-hitting appearances early in spring training. Ohtani, followed by a horde of Japanese reporters and TV crews, has been the major subject of attention since pitchers and catchers reported to the team’s training facility in Tempe last week.